"...Our Family is a living tree and we are all but leaves upon it. It's branches and roots spread ever wider. All too soon it will be our autumn, whereupon, we make way for new generations to come." 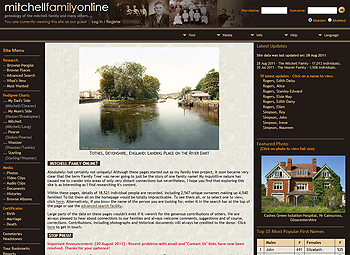 MFO: Mitchell Family Online is an extraordinary genealogy website. The family tree goes back in history as far as 1629. You can find details of 18,521 individual people recorded, including 2,567 unique surnames making up 4,540 families. You can browse names, people, places, documents and all kind of media like photos, videos, certificates, and more. The website is excellently designed and meets W3C webstandards. You can see hundreds of wonderfully illustrating historical pictures of all kind fom all around the world and videos bringing you back in time and history.